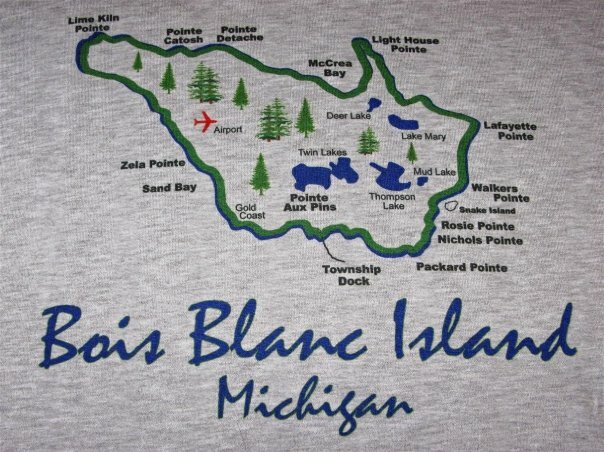 Bois Blanc Island (nicknamed Boblo) is located one mile east of Mackinac Island in the Straits of Mackinac between Lake Huron and Lake Michigan; situated between Michigan's upper and lower peninsula. The Island is 34sq miles and about 12 miles long (east/west) and 6 miles wide (north/south). Summer transportation to the Island requires boat or plane. Plaunt Transportation is the only ferry boat with service to Bois Blanc and the ferry operates between Cheboygan, Michigan and the Island. Bois Blanc has 71 year-round residents, however the population can exceed 2,000 in the summer. The Island has one general store and one tavern. One main dirt road traveres the island along with many seasonal two-track roads. The island has 6 inland lakes and several other natural and historic features. Bois Blanc is an ideal destination for wilderness enthusiasts- biking, hiking, kayacking, fishing, swimming, boating, shipwreck diving, bird and wildlife viewing, and star gazing are a few of the many outdoor opportunties to enjoy. Most of all, the Island is the perfect escape to relax and enjoy the natural beauty of Northern Michigan. The love Shack is located one row off of the lakeshore in Pointe Aux Pins. This location is in walking distance to most all island aminities, including the township dock for ferry service. The Lakefront Cabin is approx. 3 miles west of Pointe Aux Pins, beteween Zela Point and Sand Bay. This location is very convenient to the airport and for accessing trails on the west and northshore of Bois Blanc.